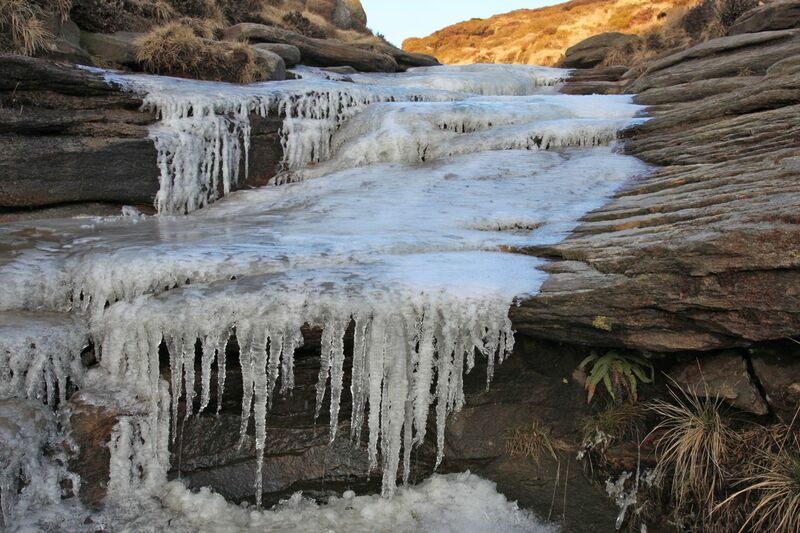 Kinder Scout is a high windswept upland gritstone plateau, most of which stands at around 600 metres above sea level. This is the largest and grandest of the upland areas of the so-called ‘Dark Peak’ in England’s Peak District National Park. 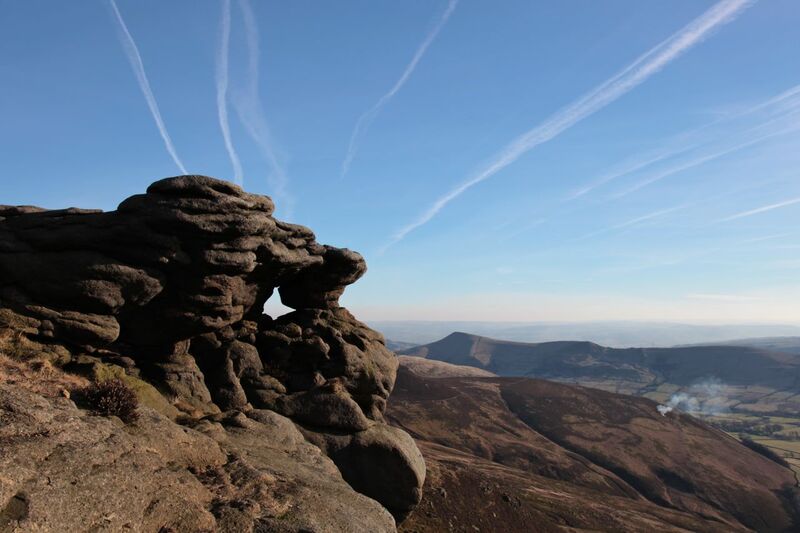 Like its southern cousin, Dartmoor, Kinder Scout is studded with stone tors and crags, which flank all of its steep edges that guard the almost featureless plateau, which covers an area of four square miles. It is the rocks that give Kinder its distinct personality. 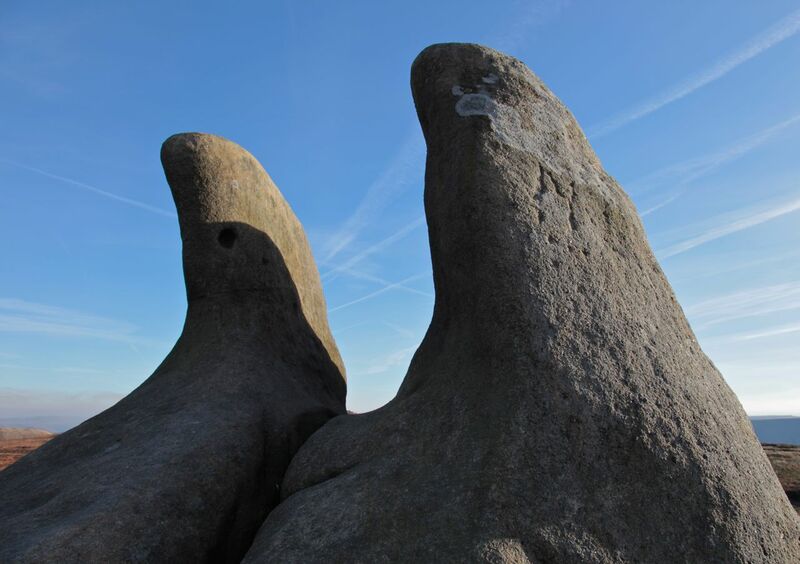 Sculpted by wind and rain and extremes of temperature, the gritstone tors act as landmarks on the plateau – strange presences that rise up out of the peat and heather. Here (1), a mushroom-shaped rock looks out over the steep sides falling into Edale; there (2), two isolated rocks are seemingly drawn towards a mysterious point in the sky; here (3), aircraft trails radiate from a hole in a rock on one of Kinder’s innumerable crags; there (4) a balancing rock frames the sweeping Edale valley behind. Without these presences, the landscape would be immeasurable, hostile and alien, as is the case on nearby Bleaklow. With them, the wild landscape assumes a reassuring character, although its meaning remains inscrutable if undeniably present. 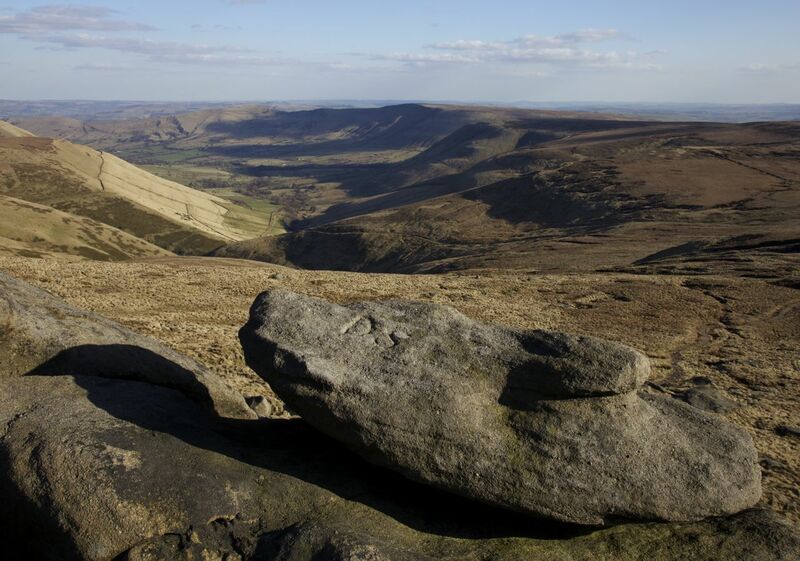 No wonder, then, that Kinder Scout was the site of a mass trespass in 1932, when thousands of walkers breached the fenced moorland to claim their right to roam, given formal recognition in 2003. 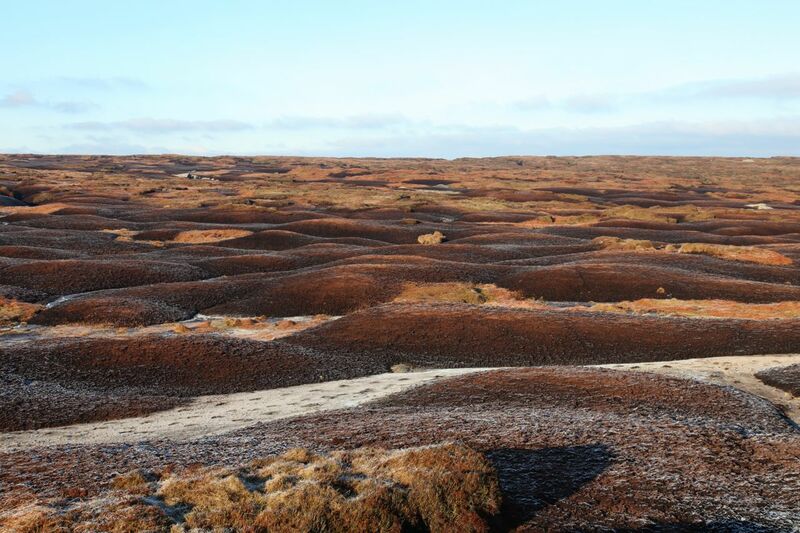 Kinder’s landscape is transformed in the winter months, when its surfaces freeze hard and one can roam over the wave-like undulations of its plateau without sinking into a quagmire (5). Here the landscape becomes almost extraterrestrial, the deep reds of the peat and endless, blank horizons confirming on it the character of an alien planet. When its streams freeze into petrified white ribbons fringed with icicles (6), the landscape assumes a silence that is not characterised by absence; rather, it opens up a space of contemplation and wonder, stopped in its tracks and frozen in time. 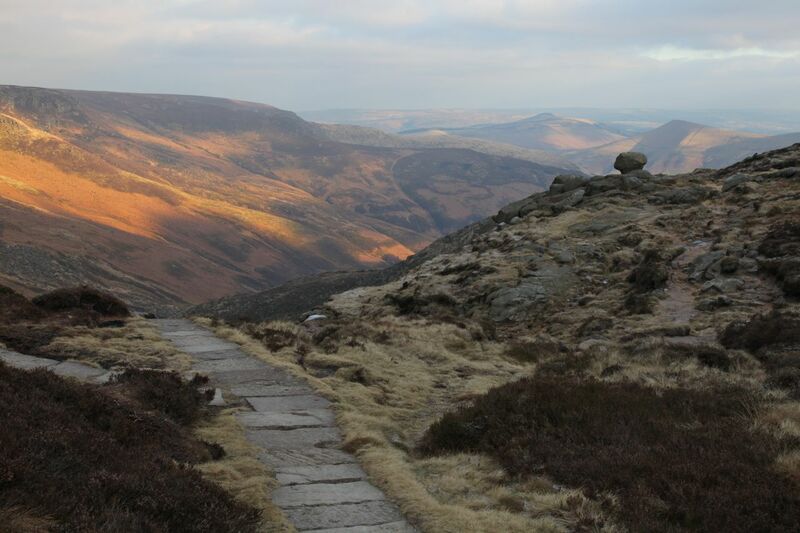 On clear days, this space of silence is only accentuated by the view of Manchester’s city-centre towers 20-miles away, gleaming behind statuesque rocks and the strange gurgling call of the grouse.